Cold feet for several reasons! It sounds like something out of a science fiction novel. An ice boat. 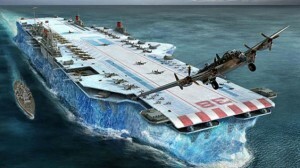 An aircraft carrier made out of ice. Who would ever think that to be a good idea? My first thought as I hear it is ‘But, but, ice and water, doesn’t water melt ice, by its own very definition?’ We’re sat around a table for the daily coffee hour when a researcher in the group regales us with the story about said ice boat (coffee hour chat is a gold mine as a source for blog post stories (a few of you might remember the spiders on drugs?) and also, according to this report crucial to excellent research). My mind was triggered and I just had to tell you all about it. Time for history-hour here at Au! A boat made of ice? As it turns out quite a few people thought that an aircraft carrier made out of ice was a good idea, Lord Mountbatten and Winston Churchill to mention some. The idea was launched in the early 1940s under the name Project Habakukk. Led by researcher Geoffry Pyke, experiments had been undertaken to create so-called ‘floating islands’ in the mid-Atlantic for aircraft. 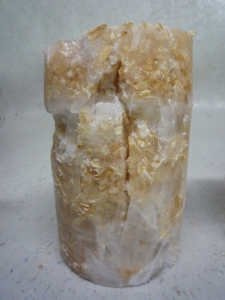 A paper was brought to his attention which described how ice was actually mixed with sawdust, forming an incredibly strong material much stronger than ice on its own, and this made the project take off in earnest. 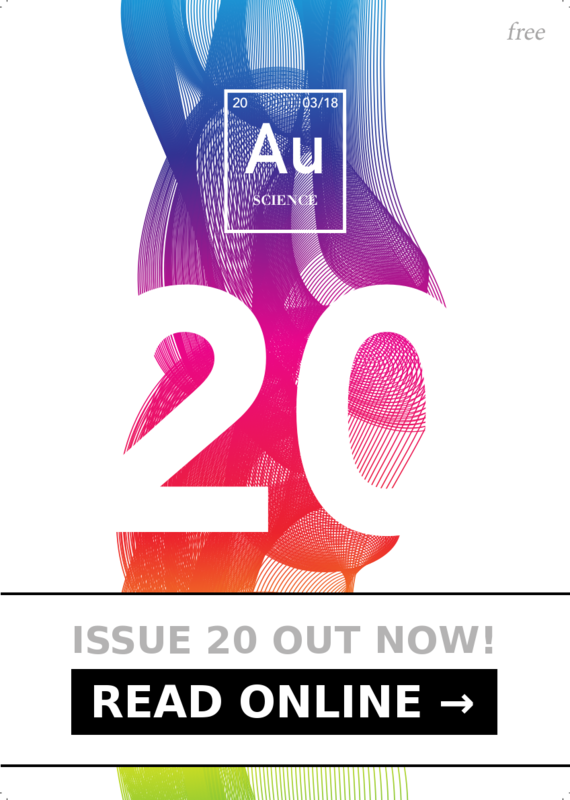 The material developed, aided by Max Perutz (who went on to win a Nobel Prize for his research into the structures of haemoglobin) was baptised pykrete in honour of the leader of the project. The sawdust in pykrete actually insulates the ice in it, giving pykrete a very low thermal conductivity, making it, if not completely suitable for journeys on water, at least more suitable than pure ice. It can also take large forces. Where a bullet would completely shatter a block of ice, if you shoot into pykrete the bullet gets embedded in the block and stays there. (As a side note, this is rumoured to have been used for demonstrative purposes by Lord Mountbatten himself. When showing off the splendour of his proposed ship building material, he pulled out his gun in the middle of a meeting shooting at both a block of ice and a block of pykrete. Effective I think!) In fact the material is very similar to a standard particleboard, but using water as binding agent rather than glue. The pykrete aircraft carrier did not see the light of day though, despite being supported by both the Canadians and the Americans. By that stage in the war better aircraft had been developed, allowing for better fuel efficiency and therefore less need for carriers. It was also realized that the masses of steel needed to create a plant to freeze the carrier were larger than would have been needed to create a vessel in steel. Not to mention the fact that the design of the vessel had become very complex. All in all, in December 1943 Project Habakukk was aborted. All in all, in December 1943 Project Habakukk was aborted. An actual (super) pykrete boat! However, 60 years later pykrete was tested by the crew behind Mythbusters, who dedicated an episode to the mystical material. They took it somewhat further though, creating super pykrete, made out of newspapers and ice, much like an iced-plywood sheet. The boat built (with the help of quite a few eager high school students) was taken out on a joy ride in the San Francisco Bay. It lasted for 30 minutes, reaching a speed of 25 mph. As I keep reading on project Habakukk I can’t help but marvel at the war effort, and the ingenuity of the engineers and thinkers of the time who dared trying out what to other people seemed rather impossible. Though, perhaps in the case of the pykrete boat, maybe we should all be thankful of the project’s end. I for sure would not feel terribly safe on a melting vessel, despite knowing that it melted at a very slow rate! If you want a more in-depth read on project Habakukk, I recommend reading this article. Anna Cederlund Anna is a PhD student in the School of Medical Sciences. She currently is busy squishing cartilage. When not looking at videos of tiny pieces of cartilage and programming MATLAB she enjoys sunny weather, tea and editing.